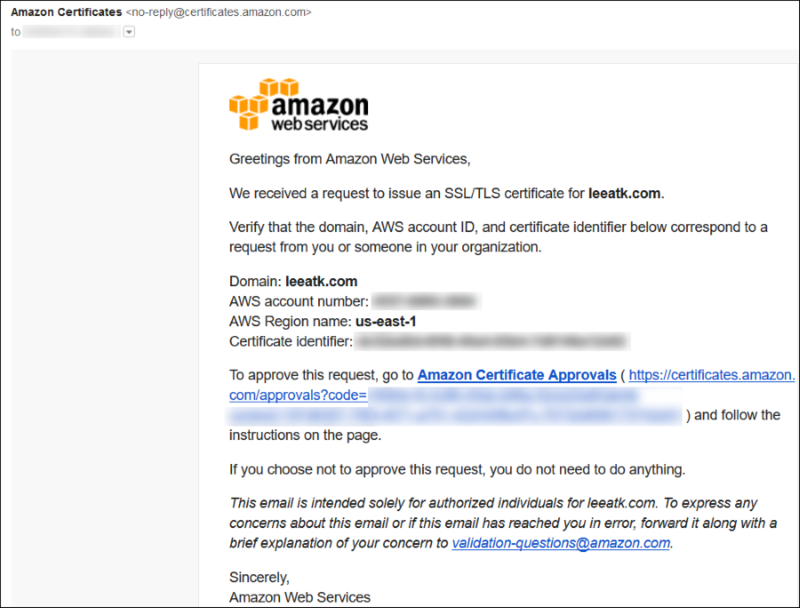 In this post, I show how you can generate Secure Sockets Layer (SSL) or Transport Layer Security (TLS) certificates by using AWS Certificate Manager (ACM), apply the certificates to your Amazon CloudFront distributions, and deliver your websites and APIs over HTTPS. Hypertext Transfer Protocol (HTTP) was proposed originally without the need for security measures such as server authentication and transport encryption. As HTTP evolved from covering simple document retrieval to sophisticated web applications and APIs, security concerns emerged. For example, if someone were able to spoof a website’s DNS name (perhaps by altering the DNS resolver’s configuration), they could direct users to another web server. Users would be unaware of this because the URL displayed by the browser would appear just as the user expected. If someone were able to gain access to network traffic between a client and server, that individual could eavesdrop on HTTP communication and either read or modify the content, without the client or server being aware of such malicious activities. Hypertext Transfer Protocol Secure (HTTPS) was introduced as a secure version of HTTP. It uses either SSL or TLS protocols to create a secure channel through which HTTP communication can be transported. Using SSL/TLS, servers can be authenticated by using digital certificates. These certificates can be digitally signed by one of the certificate authorities (CA) trusted by the web client. Certificates can mitigate website spoofing and these can be later revoked by the CA, providing additional security. These revoked certificates are published by the authority on a certificate revocation list, or their status is made available via an online certificate status protocol (OCSP) responder. The SSL/TLS “handshake” that initiates the secure channel exchanges encryption keys in order to encrypt the data sent over it. To avoid warnings from client applications regarding untrusted certificates, a CA that is trusted by the application must sign the certificates. The process of obtaining a certificate from a CA begins with generating a key pair and a certificate signing request. The certificate authority uses various methods in order to verify that the certificate requester is the owner of the domain for which the certificate is requested. Many authorities charge for verification and generation of the certificate. The process of requesting and paying for certificates, storing and transporting them securely, and repeating the process at renewal time can be a burden for website owners. ACM enables you to easily provision, manage, and deploy SSL/TLS certificates for use with AWS services, including CloudFront. ACM removes the time-consuming manual process of purchasing, uploading, and renewing certificates. With ACM, you can quickly request a certificate, deploy it on your CloudFront distributions, and let ACM handle certificate renewals. In addition to requesting SSL/TLS certificates provided by ACM, you can import certificates that you obtained outside of AWS. CloudFront is a global content delivery network (CDN) service that accelerates the delivery of your websites, APIs, video content, and other web assets. CloudFront’s proportion of traffic delivered via HTTPS continues to increase as more customers use the secure protocol to deliver their websites and APIs. CloudFront supports Apple’s ATS requirements for TLS 1.2, Perfect Forward Secrecy, server certificates with 2048-bit Rivest-Shamir-Adleman (RSA) keys, and a choice of ciphers. See more details in Supported Protocols and Ciphers. 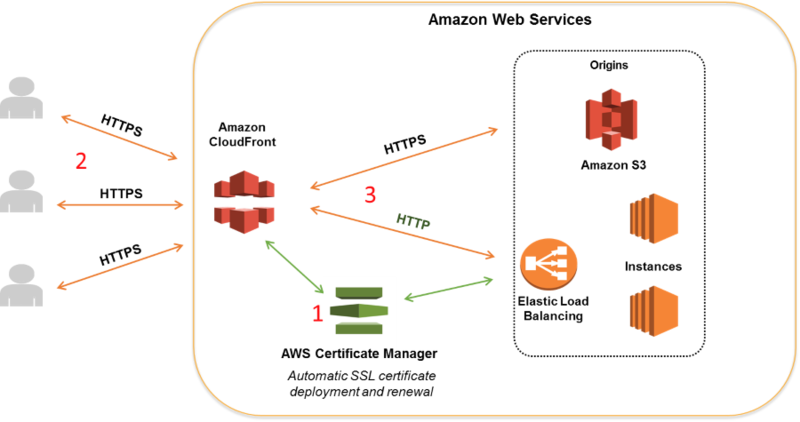 The following diagram illustrates an architecture with ACM, a CloudFront distribution and its origins, and how they integrate to provide HTTPS access to end users and applications. 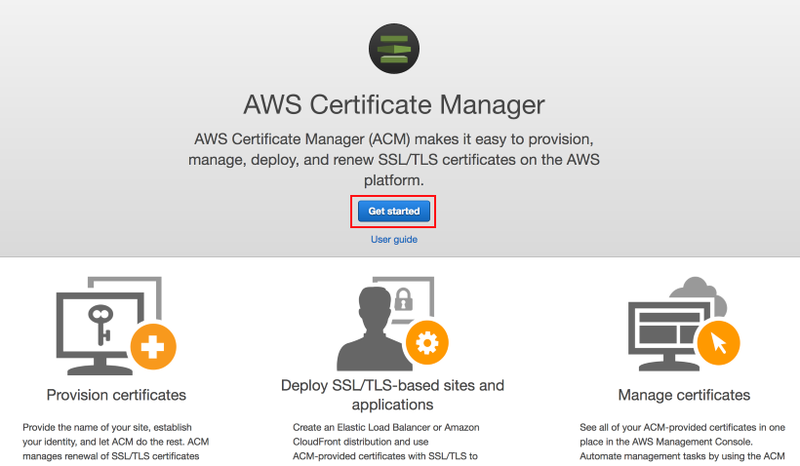 ACM automates the creation and renewal of SSL/TLS certificates and deploys them to AWS resources such as CloudFront distributions and Elastic Load Balancing load balancers at your instruction. Users communicate with CloudFront over HTTPS. CloudFront terminates the SSL/TLS connection at the edge location. 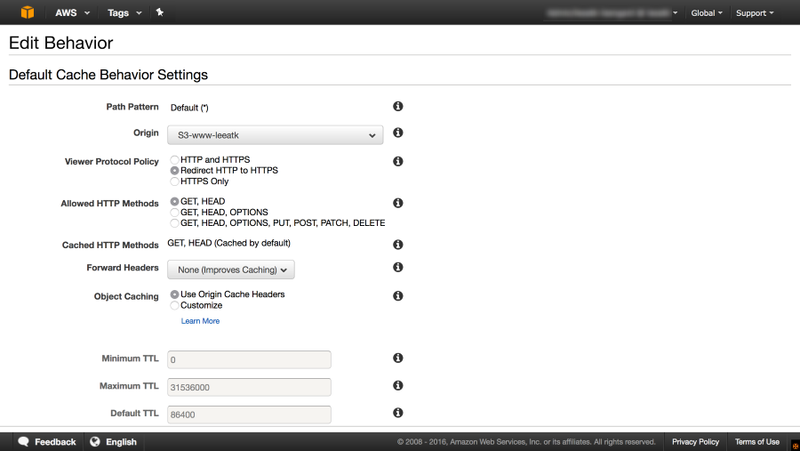 You can configure CloudFront to communicate to the origin over HTTP or HTTPS. CloudFront enables easy HTTPS adoption. It provides a default *.cloudfront.net wildcard certificate and supports custom certificates, which can be either created by a third-party CA, or created and managed by ACM. ACM automates the process of generating and associating certificates with your CloudFront distribution for the first time and on each renewal. CloudFront supports the Server Name Indication (SNI) TLS extension (enabling efficient use of IP addresses when hosting multiple HTTPS websites) and dedicated-IP SSL/TLS (for older browsers and legacy clients that do no support SNI). CloudFront also supports HTTP/2, for which many browsers require HTTPS. 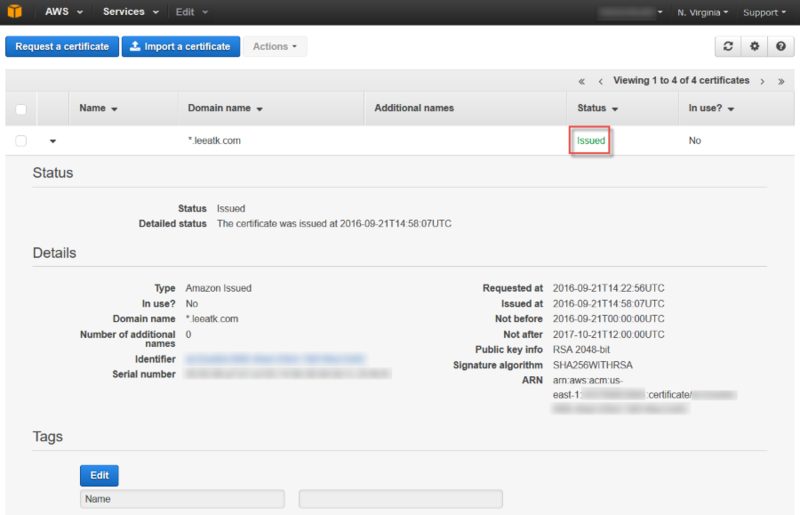 Creating certificates with ACM and using SNI with CloudFront incur no additional cost. All CloudFront edge locations terminate SSL/TLS near the client, offloading encryption to CloudFront’s servers, which are specifically designed to be highly scalable and performance optimized. CloudFront supports HTTPS features such as OCSP stapling and SSL/TLS session tickets. Keeping that background information in mind, I will now show you how you can generate a certificate with ACM and associate it with your CloudFront distribution. In order to help deliver websites and APIs that are compliant with Apple’s ATS requirements, you can generate a certificate in ACM and associate it with your CloudFront distribution. Go to the ACM console and click Get started. Note: To use an ACM certificate with CloudFront, you must request or import the certificate in the US East (N. Virginia) Region. ACM certificates in this region that are associated with a CloudFront distribution are distributed to all the geographic locations configured for that distribution. On the next page, type the website’s domain name for your certificate. If applicable, you can enter multiple domains here so that the same certificate can be used for multiple websites. In my case, I type *.leeatk.com to create what is known as a wildcard certificate that can be used for any domain ending in .leeatk.com (that is a domain I own). Click Review and request. Click Confirm and request. You must now validate that you own the domain. ACM sends an email with a verification link to the domain registrant, technical contact, and administrative contact registered in the Whois record for the domain. ACM also sends the verification link to email addresses commonly associated with an administrator of a domain: administrator, hostmaster, postmaster, and webmaster. ACM sends the same verification email to all these addresses in the expectation that at least one address is monitored by the domain owner. The link in any of the emails can be used to verify the domain. Until the certificate has been validated, the status of the certificate remains Pending validation. When I went through this approval process for *.leeatk.com, I received the verification email shown in the following screenshot. When you receive the verification email, click the link in the email to approve the request. After you click I Approve on the landing page, you will then see a page that confirms that you have approved an SSL/TLS certificate for your domain name. Return to the ACM console, and the certificate’s status should become Issued. You may need to refresh the webpage. Now that you have created your certificate, go to the CloudFront console and select the distribution with which you want to associate the certificate. Click Edit. Scroll down to SSL Certificate and select Custom SSL certificate. From the drop-down list, select the certificate provided by ACM. Select Only Clients that Support Server Name Indication (SNI). You could select All Clients if you want to support older clients that do not support SNI. Save the configuration by clicking Yes, Edit at the bottom of the page. Now, when you view the website in a browser (Firefox is shown in the following screenshot), you see a green padlock in the address bar, confirming that this page is secured with a certificate trusted by the browser. We encourage you to use HTTPS to help make your websites and APIs more secure. Therefore, we recommend that you configure CloudFront to redirect HTTP requests to HTTPS. Go to the CloudFront console, select the distribution again, and then click Cache Behavior. In my case, I only have one behavior in my distribution. (If I had more behaviors, I would repeat the process for each behavior that I wanted to have HTTP-to-HTTPS redirection) and click Edit. Next to Viewer Protocol Policy, choose Redirect HTTP to HTTPS, and click Yes, Edit at the bottom of the page. I could also consider employing an HTTP Strict Transport Security (HSTS) policy on my website. In this case, I would add a Strict-Transport-Security response header at my origin to instruct browsers and other applications to make only HTTPS requests to my website for a period of time specified in the header’s value. This ensures that if a user submits a URL to my website specifying only HTTP, the browser will make an HTTPS request anyway. This is also useful for websites that link to my website using HTTP URLs. CloudFront and ACM enable more secure communication between your users and your websites. 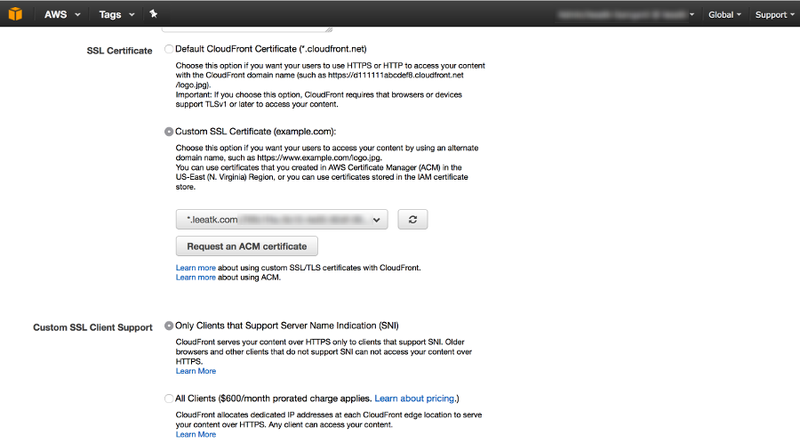 CloudFront allows you to adopt HTTPS for your websites and APIs. ACM provides a simple way to request, manage, and renew your SSL/TLS certificates, and deploy those to AWS services such as CloudFront. Mobile application developers and API providers can more easily meet Apple’s ATS requirements now using CloudFront, in time for the January 2017 deadline. If you have comments about this post, submit them in the “Comments” section below. If you have implementation questions, please start a new thread on the CloudFront forum.